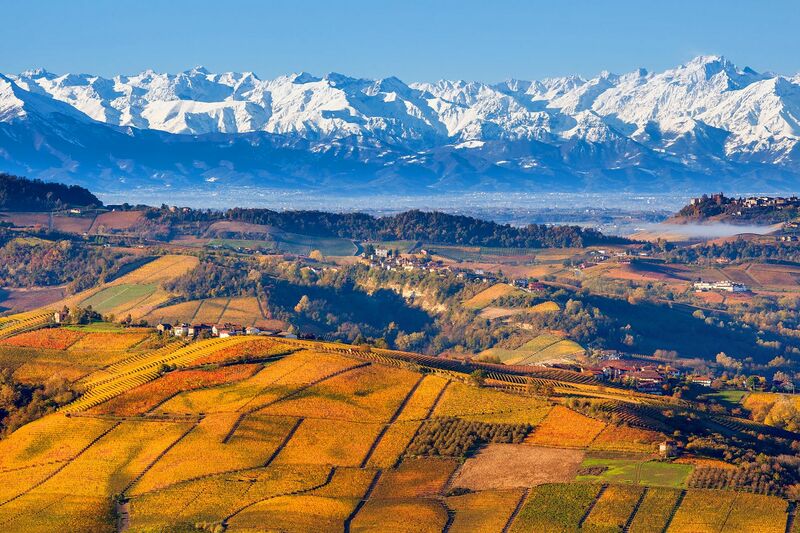 Piedmont, with its mountains, lakes and plains, is one of the main winter tourist destinations in Italy. Along with good wine and quality food, this region has something for everyone. The high quality facilities and steep downhill slopes make this region a skiing paradise. As well as sport and nature, there are plenty of cultural attractions to be found in the various towns. Turin, which hosts internationally famous events and boasts prestigious museums, offers the opportunity to indulge your interests in art and history, all the way from antiquity to the contemporary era. The region has been the industrial centre of Italy since Emanuele Filiberto decided to move the capital of his kingdom from Chambery to Turin in 1561. It made sense in fact, since Piedmont sits strategically in the west of Italy, in a perfect place to intercept all of the area's trade traffic. Its proximity to France and Switzerland has also helped massively to diversify its offering and with the port of Genova nearby, there has always been easy access to the sea. Piedmont's attractions are manifold, especially in the region's capital Turin. Famous birthplace of Fiat, the city is the natural home of the Museo dell'Automobile, which runs visitors through the history of the prominent car manufacturer. Turin's grey and industrial past has these days given way to a newer, shinier city, whose public transport system has been greatly improved in recent years with the extension of both Porta Susa and Porta Nuova stations, as well as the opening of a metro system which makes travel around the city centre much easier. Along with its history of cars, Turin also holds fascinating testaments to other periods of history, altogether distinct from its own. The Museo Egizio, located in the city centre, is the second largest museum dedicated to Egyptian history after Cairo's Egyptian Museum. The Mole Antonelliana, not far from the museum, is one of Europe's tallest stone buildings at 167.5 metres. If you climb to the top, it offers a fantastic panorama of the city below. Inside, the tower is home to the Museo del Cinema, the only museum on cinema in Italy with a vast collection of cameras from decades past and a large spread of movie posters. Turin is also an important hub for religious tourism. Its buildings hold one of the most Catholic histories of any city in Europe. The Cattedrale di San Giovanni Battista is said to house the Sindone, the shroud in which Christ was wrapped after he was brought down from the Cross. But Piedmont is far more than just its capital city. Surrounded on three sides by the Alps, it also holds the highest peaks and largest glaciers in Italy which make it the country's prime winter destination. Mountains such as Monviso make for incredibly beautiful scenery and you'll find ski resorts every way you turn. In particular, Via Lattea and Sestriere welcome large numbers of winter sports enthusiasts with their modern facilities and abounding accommodation options. Down from the mountains, you'll find large expanses of water and even rice paddies make up the plains of this otherwise hilly region. The areas around Novara and Vercelli are the best known for these landscapes, with long rows of poplar trees and old farmhouses dotting the countryside. It is here that you'll also find Lago Maggiore, a beautiful stretch of water extremely popular with visitors in the summer for its ancient villas and stunning gardens. Last but not least, the region's imposing set of Medieval castles deserve to be visited, including the fortress at Ivrea. Those with a penchant for architecture should also add the Residences of the Royal House of Savoy and the Sacri Monti to their list, constructed by the Savoy family during the 17th and 18th centuries. One of the best ways to explore Piedmont is on a culinary tour. Those with local food and wine on their minds should head straight for the area around Langhe, Monferrato and Roero. This UNESCO World Heritage site covers over 10,000 hectares and is home to some of the most famous Piedmontese wines, including Barolo, Barbaresco, Asti Spumante and Barbera d'Asti. Continuing with the tour, aim to make a visit to the Festa Internazionale del Tartufo d'Alba, which runs from September to November and celebrates all things truffle. Another speciality of the region is the Fiera del Bue Grasso (Fat Ox Fair) which takes place in Carrù and celebrates one of Piedmont's most traditional dishes. Entirely immersed in fog during the winter months, the plains around Vercelli are used almost exclusively as rice paddies. In the summer, small paths criss-cross its watery surface, as they have for centuries. The province produces more than a hundred different varieties of rice, from Baldo all'Arborio, through to the New Maratelli and Sant'Andrea. Each variety is used in the preparation of different dishes, including soups, risotto and pancakes. Another little-known area that merits a visit is Canavese, which extends out from Turin to the Valle d'Aosta, Biella and Vercelli. Its capital Ivrea is known for its beautiful historic centre, as well as the canal which runs through it, carrying water to the rice paddies around Vercelli. But Ivrea is most famous for its Carnival, which celebrates the town's liberation from a tyrannous baron who tried to starve the population to death. The celebrations culminate in a spectacular Battle of the Oranges, where teams compete against each other by throwing as many oranges as fast and hard as they can. Steeped in many years of history, Piedmont is rife with folklore and traditions. One of the better known figures from this narrative is the masca. She is a witch or sorceress who appears to be a normal woman but is equipped with supernatural powers. These are passed down through the generations from mother to daughter or grandmother to granddaughter. As well as its fascinating folklore, you'll also find a host of festivals which take place in all the small villages throughout the region. The famous Feira del Tartufo takes place in Alba every autumn, with strange customs to go along with the 50-year-old festival. As well as going for the truffles themselves, villagers dress up in traditional clothing and compete for the best costume, judged by expert panels. Italy's ministry for food and agriculture has recognised a total of 341 Piedmontese products as 'traditional'. It was classified as the fifth Italian region in terms of traditional products, behind Tuscany, Campania, Lazio and Emilia-Romagna. Piedmont's selection of cold meats is second to none. The typical antipasti plate will hold various salamis, infused with garlic, rosemary and other herbs which are grown locally in the mountainous areas of the region. One of its most typical cheeses is called tomino, a fresh cheese often served with chillis, tomato sauce, olive oil and vinegar. If you want to try one of the most representative dishes in Piedmontese cuisine, it has to be fritto misto alla piemontese. Rather than being made up of fixed ingredients, it is a dish which changes with the seasons and the preference of the chef but is essentially made up of lots of fried meat and vegetables. Sausage, chicken, liver, brains, aubergines and courgettes are all covered in flour and egg before being fried in plenty of butter or olive oil. It's naughty but hey, you're on holiday! Wine is another extremely important element in Piedmontese tradition and cuisine. The provinces of Alessandria, Asti and Cuneo produce fabulous sparkling wine called Alta Langa. Another white wine, known as Erbaluce di Caluso, is produced in Biella, Turin and Vercelli. Find weekly weather forecasts for Piedmont . Different criteria make it possible to predict with precision the best time of year to go to Piedmont . A comprehensive weather score, made up of temperature indicators, bad weather predictions, sunshine levels and wind speeds, will allow you to choose the activities best suited to the weather conditions and therefore make the most of your holiday in Piedmont . Our journalists' reviews for you 1 hotels Italy . Take a look at our hotels, their facilities or their value-for-money score according to your departure dates so that we can find the best offer to suit you Italy . Book a hotel Italy it's never been so simple !